Self contained studios with kitchenette, breakfast bar, full bathroom, washing machine, queen bed, TV lounge with sofa bed. 2 x townhouses. Each has 2 x queen bedrooms, 2 x sleepouts, 2 x bathrooms. Kitchen, lounge, outdoor entertainment area. RYLANCE HOLIDAY HOMES. Brisbane inner city homes. Choose from 9 options. Come to us direct to save. We are easy to find. 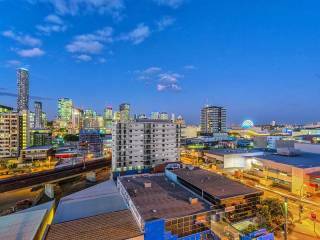 Would you like to stay in a home that has been purpose built for the short term visitor looking to enjoy Brisbane in comfort, style and not so pricey? Auchenflower Townhouses & Studios. This 1940s original Queenslander was converted into flats in 1960, complete with asbestos walls, totally unworkable floor plan, no fire separation and in need of love. 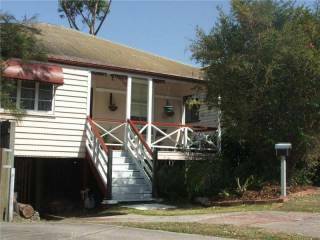 We have stripped it back to its frame and purpose rebuilt for short term visitors to enjoy Brisbane in comfort, style and not so pricey? The 2 upper level townhouses and opened in November 2015. 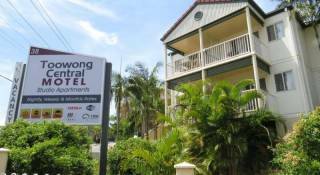 They each feature twin queen ensuited bedrooms, and both bedrooms have an adjacent sleepout with extra bed, (Queensland speak for closed in verandah used for extra bedroom). The right side has been decorated in cool greys, aquas and lime shades. The left side features the warmer reds, oranges and beige tones. The twin studios opened March 2016. Fully self contained with private access and air conditioning, perfect for singles or couples seeking comfort in a quiet space. Located just 3kms (1.8mls) from the CBD this is the perfect postion for guests who would like to experience suburban Brisbane living and still have ready access to the city. 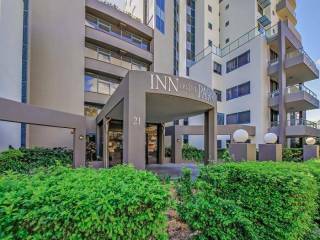 It is positioned close to Wesley Hospital, Lang Park (Suncorp Stadium for those under 40!) and University of Queensland. THE TOWNHOUSES (2) - OCCUPY THE UPPER LEVEL. There are 2 mirrrored townhouses on the upper level. Both have 2 queen bedrooms, 2 ensuites. One ensuite has 2 way access and one has a full sized bath. Each bedroom also has a door going through to a sleepout, (for non-Queenslanders, that means an extra room that's not quite as big as a bedroom! ), each with a either a king single bed or a day bed/futon - a total of 6 people can occupy each duplex. If you're not using the sleepouts as bedrooms, these are extra living areas or storage. 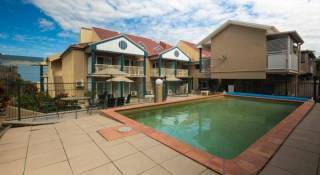 The living areas are beautifully furnished and are pleasant and open, and come with TV and DVD and Wifi and Foxtel included. We include a selection of DVDs and books for you as well. Sliding doors take you out to the covered pergola with barbeque and outdoor seating. Your backyard is private, and if you are renting both townhouses there is a connecting gate for easy access between both homes. The back garden and side areas are fully fenced for children and pet safety. The kitchen is fully equipped with everything you need, and excellent quality appliances. Each side has its own washing machine, dryer, outdoor line, iron and spare bar fridge. Keypad entry with your selected 4 digit code. No keys required. Fully ducted air con throughout. Each studio has private side access and no keys are required as you select your own 4 digit code for keypad entry. The spacious apartments are fully self contained. The queen bed enjoys some privacy behind the nib wall which separates the sleeping area from the TV lounge. The flatscreen TV has a built in DVD player and there is a selection of books and DVDs and wifi internet of course. There is a full sized bathroom with a front loader washing machine and iron. The kitchenette has a convection builtin hot plate, good sized fridge, convection microwave and breakfast bar for 2. Each side features a remote controlled reverse cycle air conditioner as well as a ceiling fan. There are security bars and privacy blinds on the windows. PARKING: There is offstreet parking for 4 cars, 1 per unit. DISPOSABLES: We supply some starter disposables as a complementary service. They include - dish detergent, tablets for dishwasher, scourer, dish cloth, sachet for washing machine, toilet paper, tea + coffee, paper towels, alfoil, cling film, vinegar + oil, salt + pepper, sugar, liquid soap, shower cap, shampoo + conditioner. If you choose to replace some of these items, or leave your excess that is appreciated. They are not renewed during your stay. PANTRY AND ALCOHOL: Often guests leave some items that we don’t remove if we think they may be useful for the next guest, and some we have supplied. This may include some spirits or drinks. You are welcome to enjoy what is there, and if you choose to leave some of your own, thank you for that. SERVICING: If you would like to engage our cleaners for linen change or house clean during a longer stay, please ask for a quote. If you choose to look after this yourselves, there are washing facilities, some basic cleaning products, vacuum, broom, mop, dustpan. Full laundry with front loader washer, dryer, iron and ironing board. PETS: We have our Spice Dogs - Chilli and Basil - black and tan dachshunds, so we know that pets are people too. We can't say we are a family friendly business if you can't bring some of your family with you to stay in our homes. We have some conditions to you bringing them, (we have some conditions for people too), and have developed quite a good "responsible pet owner radar" and apply it ruthlessly! Sorry, but no pets in season or excessive hair shedders. Not permitted in the carpeted areas nor on furniture. Please clean up after them inside and out. We supply pet bowls as well. “Property” means the Rylance Hometel home. and all its fixtures, fittings and equipment. “Management” means the owners and managers of the Property. Smoke detectors have been located throughout the home, please ensure they are not tampered with, or you may lose your security deposit. If a battery needs replacing please let us know, or if you are confident to change it, spares are in the bottom kitchen drawer. Check-in time is not before 3 pm on the arrival date and check out time is not later than 10 am on departure date, unless otherwise agreed. You must notify Management of expected arrival time and a mobile contact number at least 2 days before arrival. A deposit of 50% is required at time of booking. Bookings are not confirmed unless and until this deposit is received. Payment in full must be received no later than 1 MONTH prior to your arrival. Credit card payments are through PayPal and attract 2.5% for Australian transfers and 3.5% for International transfers. If you have paid more than the deposit or paid in full and cancel your Booking you will be refunded the money paid over the deposit, if 1 month notice is received. Should you be eligible for a refund it will be made through internet transfer to an Australian bank account, or via PayPal to your cc. Once full payment is made, there are no refunds for reduction of number of guests. Once full payment is made, there may be a refund for reduction of number of nights if another booking is secured. An administration charge of 1 night may be charged for any variation or cancellation. We have a minimum nights stay policy of 3 nights. No refund will be made for a variation to the extent that it breaches our minimum nights stay policy. WE HIGHLY RECOMMEND YOU SECURE TRAVEL INSURANCE, WHICH WILL COVER ANY COSTS YOU INCUR FOR CANCELLATION OF BOOKING. (Conditions apply). A security deposit is required before arrival via internet or in cash on arrival if you prefer. It will be credited to your Australian bank account or cc via Paypal once our property has been inspected and deemed left in a similar state to your arrival. We agree to ensure this occurs within 7 working days of your departure. The trigger for this payment to be made is for you to email your bank details at the completion of your rental. If the Property becomes unavailable for your occupancy due to unforeseen circumstances (eg. fire, storm, damage, etc), then Management will inform you immediately and endeavour to obtain suitable alternative accommodation for your occupancy; failing which any moneys paid will be refunded in full for any unused nights. Quotations are given on the home that best suits your original enquiry re numbers and location and preference. Bookings for 2 wks or more will be guaranteed any particular home of choice if available. Bookings of less than 2 weeks who are not flexible in which home they are allocated, please call to discuss. Parties and Functions are strictly prohibited. Small groups for dinner are welcome, but noise must not be audible to neighbours between 10pm (11pm Fri and Sat nights) and 8am. You have rented a suburban home and as such stringent rules need to apply to noise. Unfortunately past guests have sorely tested our neighbour’s patience hence these conditions. Neighbours at each home have our contact numbers. In the event they call us for excessive noise, there will be one warning and $100 penalty applies. If called twice or if the police are called out, then YOUR SECURITY DEPOSIT WILL BE FORFEITED. Pets are allowed at the Property by arrangement only. Pet owners are responsible for cleaning up after their pets both within and outside the property. Pets are not allowed on furniture at any time. Any evidence of pets on furniture may incur extra cleaning fees. Professional flea treatment may need to be carried out at Guests expense. Dogs in season or prone to shedding hair are not permitted. AUSTRALIA HAS THE HIGHEST POWER BILLS IN THE WORLD. Upon leaving if an airconditioner is left on, you may be charged for excess power use, as sometimes we may not get to the home the day of departure. Each home has an outdoor line, and in fair weather please use these not the dryers. Dryers are supplied for wet weather only. Only the guests nominated and agreed in the Booking may stay in the Property over night. If any other guests stay extra charges may apply or the agreement may be terminated without refund. ANY GUESTS IN EXCESS OF THOSE PAID FOR WILL BE CHARGED AT DOUBLE THE NORMAL RATE. If you rent more than one unit in the same property, ALL items must be returned to their original positions.